Lynne Stone will be demonstrating her unique style of botanical art on Sunday 10th April from 12.30pm to 2.30pm. Lynne is a botanical artist who will be demonstrating her techniques at the Kilmore Art Expo. 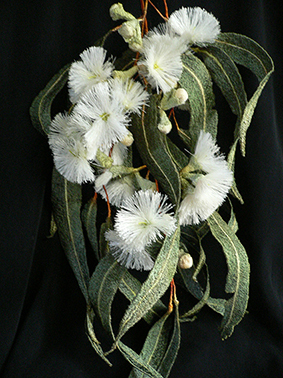 She completed a 2 year Certificate of Art & Design (Embroidery) course at Box Hill TAFE in the 1990s and then spent 10 years travelling Australia exploring the fascinating diversity of the countryside and collecting original pieces of flora. Lynne now uses these to convey her delight in Australia’s native plants by creating realistic models using machine embroidery. The three-dimensional pieces are made from fine wire and organza, heavily machine stitched with white rayon and/or polyester threads. These are then painted with dye and restitched with hand-dyed threads to add veins and special features. The detail of the piece is important – its myriad colours, the emerging flowers and leaves, and marks of insect damage etc. Each new specimen demands new techniques, and each new technique presents new problems and new solutions. Christina Kent, a talented local craftswoman, will be demonstrating her skills at the Kilmore Art Expo on Saturday 9th April at 12.30pm to 2.30pm. Her garments are exquisitely handcrafted and unique in design. Her demonstration, showing interested visitors the basics and answering question regarding felting, is one not to be missed. Christina started to explore felting eight years ago after seeing a wedding dress at an exhibition. She was fascinated with the properties of wool and its connection to other natural fibres and wanted to know more. After completing a felting class at a fibre forum at Halls Gap, Christina was hooked, and what followed was membership in the Victorian Felters and the International Felters with her work being exhibited with the Victorian Felters at their bi-annual exhibition. Christina loves exploring and experimenting with different types of wool and natural fibres and fabrics, and participates in regular workshops with international and Australian felters. Keen to improve and hone her technique she spent a week in New Zealand with a Southern Hemisphere Convergence. She is currently developing her own technique that will be uniquely hers and her long term goal is to hold an exhibition of her own collection. A number of garments made by Christina will be on display at the Kilmore Art Expo, so don’t miss this wonderful opportunity to meet and speak with this talented lady. Rob’s unusual perspective, colour and the creation of illumination through thick and thin layers, has culminated in this superb work”. Well seen, lovely composition, obvious connection between photographer & subject. moving work. Her handling of the medium is of a high standard. Winner of Best Local Scene: Jayne Henderson: ”Wandong”. The photo shows Jayne being presented with her award by Mandy Heather, Manager of ”Willowmeade” which is at Kilmore. Judges Comment: Jayne’s painting of Wandong, near Kilmore, leads the eye through the painting to the focal point (the town) and on to the hills beyond. Good handling of her mediium. A lovely piece. Judges Comment: ”Wendy’s unusual use of watercolour combined with a wonderful composition gives this work a very contemporary feel”. Judges Comment: Helen’s use of complementary colours and an interesting composition with light and shadow result in a little gem. Judges Comment : Richard’s handling of the paint and a wonderful brush sense has created a beautiful seascape. The “Best Oil” in the Kilmore Art Expo for 2015 was awarded to Richard Chamerski. ”Richard’s handling of the paint and a wonderful brush sense has created a beautiful seascape”. Helen’s use of complementary colours and an interesting composition with light and shadow result in a little gem.